Please visit Radius Books to order the trade or limited edition. David Scheinbaum and Janet Russek started photographing the area in 1999, and have chronicled a time of extraordinary transformation. Undergoing rapid gentrification into a “hipster” neighborhood, the future of the Lower East Side is now unclear. In 2008, the National Trust for Historic Preservation added the neighborhood to its list of America’s Most Endangered Places, and many believe the cultural institutions and ideologies that established the Lower East Side are disappearing forever. 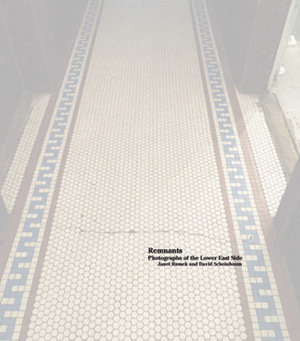 With this book, Scheinbaum and Russek capture remnants of history through their intimate portraits of traditional businesses, places of worship, people, and the old world architecture that have defined the Lower East Side for generations. David Scheinbaum is former Director/Chair of the Photography Department at the Santa Fe University of Art and Design, and Professor Emeritus, College of Santa Fe. His photographs of New Mexico’s Bisti Badlands can be found in his book Bisti, published by the University of New Mexico Press, 1987. In 1990, Florida International University Press published Miami Beach: Photographs of an American Dream. In 2006, the Museum of New Mexico Press published Stone: A Substantial Witness. He and his wife, Janet Russek, have collaborated on two projects: Ghost Ranch: Land of Light, Photographs by David Scheinbaum and Janet Russek, Balcony Press, 1997; and Images in the Heavens, Patterns on the Earth: The I Ching, Museum of New Mexico Press, 2005. Hip Hop: Portraits of An Urban Hymn, Damiani Editore, 2012, featured work that was exhibited at The National Portrait Gallery of the Smithsonian Institution, Norton Museum of Art, and the Institut du Monde Arabe, Paris. His current work focuses on the production of paper negatives addressing black culture and racism in America. Scheinbaum worked with the preeminent photo historian Beaumont Newhall from 1978 until Newhall’s death in 1993, and continues as co-executor of his estate. Scheinbaum has exhibited internationally, and is represented in numerous museum collections. Janet Russek’s work is represented in several museums and private collections, and her photographs have been exhibited both nationally and internationally. Russek has collaborated with her husband, David Scheinbaum, on two previous publications, Ghost Ranch: Land of Light, Photographs by David Scheinbaum and Janet Russek, Balcony Press, 1997, and Images in the Heavens, Patterns on the Earth: The I Ching, the Museum of New Mexico Press, 2005, which won the American Association of Museums award for design in 2005. An accompanying exhibition traveled through the Museum of New Mexico. In 1993, Russek began photographing still lifes that evolved into a twenty-year project using her imagery metaphorically to relate to the birth and death cycle. This work culminated in the publication of The Tenuous Stem, Radius Books, 2013. Her current work addresses contrasting high and low culture through the use of words and images. This project pairs photographs of classical sculpture and painting with phrases from the subject line of spam emails that she has collected over many years. Russek worked with Eliot Porter, considered the father of color photography and renowned for his quiet, elegant photographs, from 1980 until the time of his death in 1990. Russek and Scheinbaum are private photography dealers and consultants in Santa Fe, New Mexico, representing the Estates of Beaumont and Nancy Newhall, and the Estate of Eliot Porter. Amy Stein-Milford is the Deputy Director of the Museum at Eldridge Street. Amy has more than 20 years of experience working at non-profit cultural institutions in New York City. She has worked at The Jewish Museum, the Writers Room, where she served as Acting Director, and the Museum at Eldridge Street, where she oversees the Museum’s interpretation, media and communications. Amy has been a speaker on museum practices and Jewish culture at special events and conferences, including for the National Trust for Historic Preservation, Council of American Jewish Museums (CAJM), and Museums Association of New York (MANY). Sean Corcoran is the Curator of Prints and Photographs at the Museum of the City of New York. These limited edition prints include a choice of one of four prints, each on 11 x 14-inch paper, signed and numbered by the artists. Gelatin silver prints by David Scheinbaum; archival inkjet prints by Janet Russek. Please indicate your choice upon checkout.